Everything is simply poured into a bowl, and mixed together. You can skip an egg or two, and add a little more coconut milk, if you like. The final amount of coconut milk, is largely dependant on how thick you want the final mixture. As we are aiming for rather thick pancakes, the mixture should be mixed to reflect this. Baking the thicker pancakes, we do not want the heat of the pan to be to high, as this will burn the one side of the pancake, before the mixture has settled enough, to enable us to turn it around and bake the other side. I use just above medium heat. 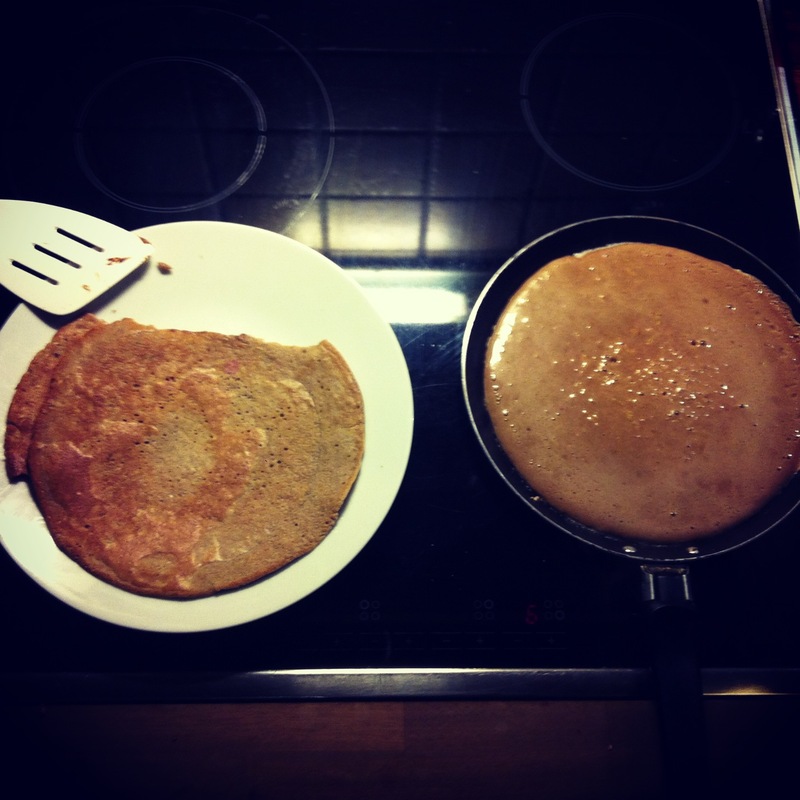 As the picture shows I have a fine little crepe pan, and the amount of mixture I pour onto each pancake is aprox. 1,5-2 dl. The hardest part with these pancakes, are without a doubt, turning them around. They tend to become rather brittle, so make sure you use as large and wide a palette knife as possible, when trying to turn them around. It took me quite some time before I was able to turn them around without breaking one of the edges. Luckely this only hurts your pride and not the taste. As general note on how to perfect them. Do not overcook, rather have the heat a little on the low side and have some patience. Cooked perfectly they will, when you cut through them, they will me slightly softer on the inside than the cooked surfaces. Cooked to much they can become a little dry. I just eat them as they are without anything on them. But only your imagination sets the boundaries. Some blue- and raspberries could add a nice fresh touch.